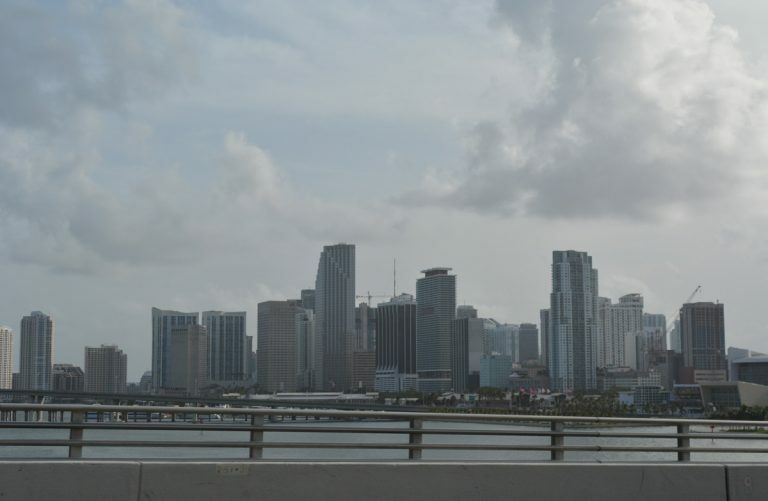 Fantastic views of the Downtown Miami Skyline are afforded to motorists traveling across MacArthur Causeway along Florida A1A north. Photo taken 09/30/17. Key West - Following Roosevelt Boulevard, SR A1A in Monroe County is a local route on the southern side of Key West. The state road begins at the intersection of Bertha Street and Roosevelt Boulevard, then passes by Key West International Airport (EYW) before meeting U.S. 1 at the east end of the island. The route is shown on some maps continuing south as a county route from Bertha Street south west to U.S. 1 at the intersection of Whitehead Street and Virginia Street, but it is not signed. Miami to Dania Beach - Within the Miami area, Florida A1A forms the main north-south route on the barrier islands and on Miami Beach. It begins at U.S. 1 and Interstate 395 and reconnects with U.S. 1 in Broward County. Known here as the MacArthur Causeway, Collins Avenue and Ocean Drive. Florida A1A replaced former U.S. 41 along the MacArthur Causeway between Miami and Miami Beach. Fort Lauderdale to West Palm Beach - This lengthy portion of Florida A1A hugs the Atlantic coast, providing for mostly tourist and beach traffic. Both ends of this section end at U.S. 1, with the southern terminus at 18th Avenue in Broward and the northern terminus at Dixie Highway in Palm Beach County. Serving beach communities such as Lauderdale-by-the-Sea, Lighthouse Point, Hillsboro Beach and Palm Beach among others, Florida A1A is known locally as Southeast 17th Street, Atlantic Boulevard, Ocean Boulevard and 21st Avenue. Palm Beach Shores - A 6.21 mile loop east from U.S. 1 around Lake Worth, Florida A1A connects Riviera Beach with Palm Beach Shores east from Blue Heron Boulevard (SR 708). North Ocean Drive extends the route north to John D. MacArthur Beach State Park and west to U.S. 1 at PGA Boulevard (SR 786). Stuart to Fort Pierce - SR A1A forms a 16.21 mile loop east from SR 714 in Stuart to U.S. 1 in Downtown Fort Pierce. The coastal route spans the Indian River east from Sewalls Point to Jensen Beach along Ocean Boulevard. North along Hutchinson Island, SR A1A continues to Ocean Village and Seaway Drive west back across the Indian River to U.S. 1. St. Lucie to Cape Canaveral - Spanning three counties at 70.63 miles in length, SR A1A again splits off from U.S. 1 to follow the coast. Florida A1A serves beach traffic and NASA installations. The state road originates in St. Lucie and spans the Indian River east to Fort Pierce Inlet State Park. Traveling north into Indian River County, Florida A1A passes through Vero Beach, Indian River Shores and Orchid. Through coastal Brevard County, the state road passes through Melbourne Beach, Indialantic and Satellite Beach. Florida A1A also serves Patrick Air Force Base south of Cocoa Beach, where it separates for three miles into a one-way couplet along Atlantic Avenue north and Orlando Avenue south. Astronaut Boulevard represents the northern extent of Florida A1A through Cape Canaveral, where it transitions to Florida 528 west across Bennett Causeway. New Smyrna Beach - A 2.08 mile snippet of SR A1A connects Downtown New Smyrna Beach with Volusia County A1A (Atlantic Avenue) south to Cape Canaveral National Seashore. Port Orange to St. Augustine - Another long section of SR A1A originates in Port Orange at the intersection of U.S. 1 (Ridgewood Avenue) and SR 421 (Dunlawton Avenue). Spanning the Halifax River across the William V. Chapel, Sr. Bridge, SR A1A connects with Atlantic Avenue north to Daytona Beach Shores and Daytona Beach. The coastal route continues north to Ormond Beach, Flagler and Beverly Beaches in Flagler County along Oceanshore Boulevard. Within St. Johns County, SR A1A travels along Anastasia Island through Butler and St. Augustine Beaches, turning inland via Anastasia Boulevard to end at U.S. 1 Business in St. Augustine. St. Augustine to Jacksonville - The northernmost section of Florida A1A crosses the Tolomato River on the Francis Mary Usina Bridge east from U.S. 1 Business in St. Augustine. It turns north along the Coastal Highway from Vilano Beach to Ponte Vedra Boulevard through Ponte Vedra Beach. Becoming more urban across the Duval County line, Florida A1A follows 3rd Street through Jacksonville Beach and Neptune Beach. Atlantic Boulevard leads the state route west along the Atlantic Beach city line to SR 10 and Mayport Road. Mayport Road extends SR A1A north to SR 101 in eastern Jacksonville and its approach to the St. Johns River Ferry. Fannin Island in Jacksonville to Callahan - SR A1A stems north from SR 105 and the St. Johns Ferry along Heckscher Drive to Fort George Island and Little Talbot Island through northeastern Jacksonville. Crossing Nassau Sound, SR A1A enters Nassau County on Amelia Island. The coastal route navigates northward along 1st Coast Highway and Fletcher Avenue to Fernandina Beach. The east-west leg of SR A1A follows Atlantic Avenue west and 7th Street south out of Fernandina Beach. The U-shaped alignment lines 8th Street south to combine with SR 200 west across the Amelia River to inland Nassau County. SR A1A & 200 overlap west to Yulee and a shared terminus at U.S. 1-23-301 in Callahan. "Neighbor to Neighbor (column)." Florida Times-Union (Jacksonville, FL), June 22, 1996.